With most Pendulum Monsters you have to choose between playing it as a monster or a Pendulum Spell, and once you decide, you can’t change your mind. With the new Pendulum Monsters from Yu-Gi-Oh! TRADING CARD GAME Structure Deck: Order of the Spellcasters, you don’t have to worry about playing your monsters as Spells because they all have effects that Summon themselves from your Pendulum Zones! After all, what good is being able to convert yourself into pure magical energy if you can’t regain your body later? This Structure Deck uses the same “Spell Counter” system as the Yu-Gi-Oh! 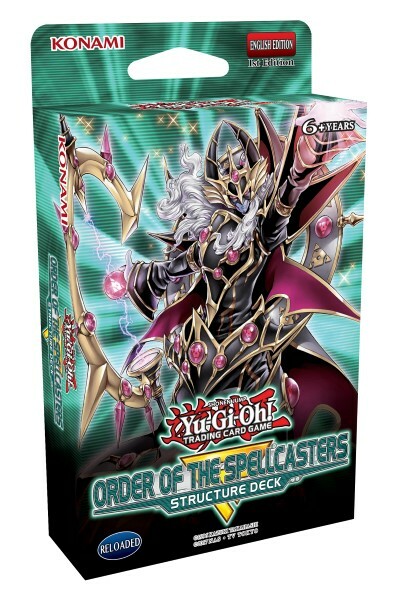 TRADING CARD GAME Spellcaster’s Command Structure Deck and the “Mythical Beast” monsters from Yu-Gi-Oh! TRADING CARD GAME Extreme Force, so cards from all three can be combined together to create an even more powerful Deck!